The 1 RU AJA HDR Image Analyzer with a display. 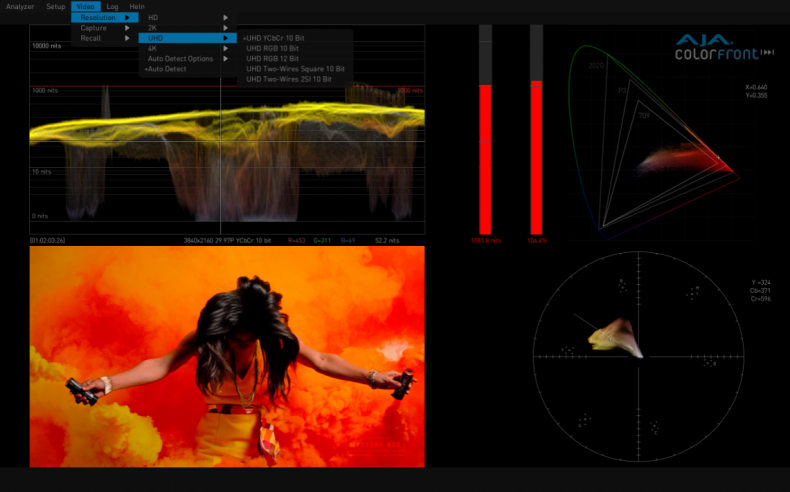 AJA has announced its new HDR Image Analyzer, an HDR monitoring and analysis appliance powered by Colorfront-developed software. The Analyzer supports the monitoring and analysis of 4K/UltraHD/2K/HD, HDR and WCG content for broadcast and OTT entertainment across production, post-production, quality control (QC) and mastering. The Video - Resolution menu, with easy access for RGB, YCbCR and Quad split vs 2SI configurations. AJA Video Systems' HDR Image Analyzer fuses AJA’s proven audio and video I/O technology with Colorfront’s powerful image analysis software. The sleek 1RU device delivers a comprehensive toolset for monitoring and analyzing HDR standards including Hybrid Log Gamma (HLG) and Perceptual Quantizer (PQ) for 4K/UltraHD workflows. HDR Image Analyzer is the second technology collaboration between AJA and Colorfront, following the integration of Colorfront Engine into AJA’s FS-HDR real-time HDR/WCG converter. HDR Image Analyzer takes in 4K sources across 4x 3G-SDI inputs and loops the video out over 4x 3G-SDI spigots to continue the video chain to wherever desired, allowing analysis at any point required in your work- flow.